In July 2013, Police arrested brotherhood members and supporters who were demonstrating in Rabaa square and Alnahda square, after finding many tortured bodies in both squares. Muslim Brotherhood admitted in the following video, the torture and the killing of 3 men and then they threw them in the trash boxes. Police arrested the MB involved in this torture and killing, after they traced the calls on one of the victim’s mobile. Video translation: My name is Ahmed Kamal, I’m a university student, faculty of commerce 3rd year,I refuse 30/6 revolution against MB, I participated in MB sit-ins and demonstrations. I knew some MB students who participated in both sit-ins, they are my colleagues in the university. We saw these 3 men walking close to Al-Nahda square, my MB colleagues said that they were thieves and must be killed, despite that I knew one of the victims, and he was not a thief. 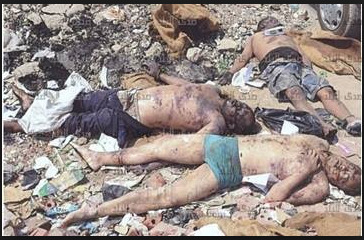 I didn’t participate in the torture or the killing, I just took their mobiles and got rid of them in the trash box, so the police won’t have any clue to identify their bodies. The police found the mobiles and this is how they arrested me, because I knew one of them. He added that this was happening to any civilian, the MB suspected that they were spying on their sit-ins or they were thugs. Muslim Brotherhood Worst Massacres Videos Against Egyptian Civilians. The following video, showing Muslim Brotherhood on 6 October Bridge on the 15th of July 2013 Cairo – Egypt. That video taken by Military Helicopters. Muslim Brotherhood demonstrators cut both ways on 6 October Bridge which is a vital Bridge In Cairo, they were attacking cars and checking drivers and passengers identities and were killing anyone they suspect like police officers or military officers and any Egyptian civilian who tries to object on blocking the roads. Muslim Brotherhood kidnapped civilians on the road, put them alive in bags as it shows in the following video, and put them on the bridge hitting them and obviously they were still alive because as you will see they were moving inside the bags, and Brotherhood were putting them on the bridge road for cars to step on them!!! The video also shows other bodies tortured, killed and tortured after getting killed then were thrown on the road for cars to step on them…Have you ever seen any savages or terrorism like this one before!!! Another video dated 16 August 2013, Ramsis sqaure – Brotherhood supporters carrying Al-Qaeda Flag in the streets of Cairo – Threatening and shooting at civilians randomly. The video show Brotherhood supporters carrying weapons and damaging private properties, looting and stealing cars. On the 21st of July, Amr Magdy Kamel, 33 years old, textile labor, found In Rabaa Square dead, with tortured deep marks all over his body and a cut in one of his ears, neck and all his nails were removed. The concerned authorities declared, that the body was discovered, when the ambulances emergency got a call from Rabaa Square (where the Brotherhood are demonstrating) claiming that the victim was hit by a car on the road! The emergency doctor called the police immediately after seeing the torturing marks all over the victim body, including the nails removal…The following is the video of the victim body in the autopsy room. Those killers enemies of humanity whom the world is claiming that they are human like you and me and they have rights, those are killers and terrorists that the world is putting pressure on the Egyptian military to release them and don’t put them to trial, those are the savages that the world is supporting them financially to kill Egyptian Civilians!!! I wonder why!? What kind of a dirty political deal the world has with those killers!? every one who is watching the massacres of those criminals against civilians and keep silent about them, he/she is a killer too! your governments are supporting brotherhood killers against Egyptians civilians! You are murderers too by keeping silent! On the 15th of July 2013, An Egyptian ex military army officer 38 years old his name is Ismail Eid, was passing by Giza road (where brotherhood were gathering and demonstrating), got stopped and when Muslim brotherhood checked his identity, they took him out of the car, stabbed him with knives, swords all over his body and then dragged him in the street, and after he was dead, they tortured his dead body and shot him in the head too; Then they hanged him between a tree and a lighting street column! People in the street were not able to save him, they were afraid because the Brotherhood started to shoot at them so they don’t go close to them! Video : Muslims brotherhood killing Egyptian Children by threwing them from the roof of one the buildings in Alexandria city. These children were stabbed and pushed from the roof, and were tortured after death too. The terrorist who led this massacre, admitted that he doesn’t regret it. He was trained in one of Al-Qaeda camps. And during the massacre, he was carrying Al-Qaeda flag. Egyptians made the greatest Revolution ever on the 30th of June 2013 and we got down the Muslim Brotherhood terrorists regime, not only in Egypt, but also the International terrorists organization of Brotherhood In the whole world, and Egyptian gave a great success example to the whole world and all the Arab countries who are suffering from dictatorship, that nothing is impossible when it comes to people rising and strong willing to live with dignity and Pride. Our war has n’t ended yet, now we are paying the price of our revolution against Terrorists and Brotherhood dictatorship from our own blood and lives, and from our soldiers and military & police blood and lives on a daily basis and we are going to pay more from our blood if that’s what it takes to live with dignity and pride. Those brotherhood that the world is calling peaceful demonstrators and they have the right to support their brotherhood terrorists leaders, they are killing us daily with cold blood, and as long as you support them, you are partners in their crimes against Egyptian civilians and military. Countries like the USA and Germany and Other European Countries who are putting economical pressure on our military to release Mohamed Morsi and his Muslim Brotherhood terrorists and asking not to put them on trials, Please know that Egyptians managed to get down Muslim Brotherhood international organization in the whole world, and no country in this whole world is allowed to put any kind of pressure on Egypt, The Egyptian military is owned by The Egyptians and work only according and in favor of Egyptians willing and not your willing. You world who are supporting Muslim Brotherhood terrorists, you are not welcome in our country, you are not welcome to step on our lands having your hands covered with the blood of our children and soldiers. Mind your own business and stick your dirty nose somewhere else! Egypt may get sick, but never dies!